Your hectic commute just took a turn for the worse. You may not have heard your alarm go off this morning, but there’s no denying that you hear the “clink-clickety-clunk” sounds that have been coming from your car for the past two miles. You pull your vehicle to the side of the road for a quick inspection, only to decide that this problem would be better handled by a real mechanic. But as you turn the key in the ignition, the vehicle refuses to start. Now, you’re stranded in an unfamiliar town, with no help in sight. When a vehicle mishap occurs, you should never have to feel stranded or alone—and with Atlas, you’ll never have to. The agile and efficient nature of light-duty tow trucks enables them to tow a wide assortment of vehicles. Light-duty tow trucks are essential for roadside assistance services, and they are frequently called upon for routine service calls—from flat tires, to engine stalls, to jump-starts, and everything in between. Similar to medium-duty tow trucks, light-duty tow trucks are equipped with a modern wheel-system, which eliminates all tow truck and vehicle contact (with an exception of the rubber on a vehicle’s tires). Light-duty tow trucks lift the vehicle off of the ground by securing either the front two or back two wheels. The other pair of wheels remains in contact with the road while the vehicle is being towed to assist in the transportation process. In addition, light-duty tow trucks have the potential to tow vehicles using the dolly towing technique. Through this technique, an extra dolly is added as an extension to the tow truck, allowing the two wheels that are not making direct contact with the tow truck to be lifted off of the ground. This, ultimately, eliminates all previously existing vehicle-to-ground contact, and is particularly helpful in instances where vehicles are unable to roll, are stuck in gear, or are heavily damaged. Which Vehicles are Light-Duty Worthy? 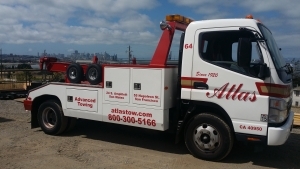 At Atlas, our light-duty tow trucks have significantly aided us in our efforts to become the most agile and efficient towing and recovery company. 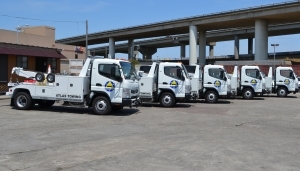 In addition to our regular light-duty tow trucks, our fleet features low-clearance, light-duty tow trucks, which enhance the extreme maneuverability characteristics of the tow truck that are necessary to access vehicles in parking garages with clearances as low as 6’6”. Our light-duty tow trucks are ideal for passenger vehicles and motorcycles, but they are also equipped to handle a large range of vehicles. With the two towing techniques that our light-duty tow trucks possess, coupled with our company’s standard to continually exceed expectations, Atlas has become an incomparable towing and servicing company. Never feel stranded again. Contact us at 800.300.5166 today, and our team members will be at your side right away. Atlas is here to help when you need it the most—any day, any time.